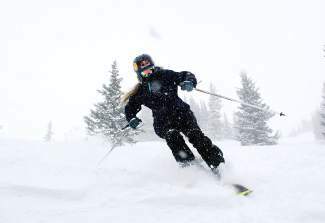 Six-time Winter X Games freeskiing medalist Grete Eliassen carves some fresh tracks at Loveland Ski Area Tuesday. She was joined by bronze medalist Nick Goepper, 2010 Olympian Louie Vito and two-time Olympian Greg Bretz for a charity group ski session with Loveland guests to promote the May Wings for Life World Run. For 14-year-old Jack Wagner, his 10-year-old brother, John, and a handful of skiers and snowboarders at Loveland Ski Area Tuesday, it was the chance of a lifetime. A morning to ski fresh lines shoulder to shoulder with four of the biggest names in freeskiing and snowboarding. Sochi Olympic freeski slopestyle bronze medalist Nick Goepper, six-time Winter X Games medalist Grete Eliassen, 2010 Olympic halfpipe snowboarder Louie Vito and two-time Olympic snowboarder Greg Bretz took to the slopes at Loveland as part of Red Bull’s and the Wings for Life foundation’s efforts to raise awareness for spinal injury research. “It was really fun,” John Wagner said after a morning of skiing. He and his brother had the chance to ride the chairlift with Goepper and watch him hit some rail features in Loveland’s small terrain park. Joined by their mother Julie, the trio were all smiles after the morning session. With 5 inches of fresh snow, close to 30 skiers and snowboarders joined Goepper and Eliassen shortly after the lifts opened at 9 a.m. Vito and Bretz connected with the group later in the day. The pros seemed to enjoy the day on the slopes as much as the kids did. For Goepper, it was one of his first opportunities to be back on the snow since competing in the Winter Olympics last month. “We were shredding the mountain all day. It was super fun,” he told the Daily. The athletes were at Loveland in an effort to promote the new Wings For Life World Run charity race — a fundraising run sponsored by Red Bull to raise money for spinal injury research. The May 4 race will take place simultaneously in 35 locations across the globe. Denver is slated to be one of the host cities for the first running. While the course isn’t finalized, it’s expected to start at Sports Authority field and go through parts of downtown. Red Bull will be covering the costs of the event so that 100 percent of the proceeds can go directly to Wings for Life. With the foundation based in Europe, it will mean a daunting 4 a.m. start time in Denver. About half of all spinal injuries are due to automotive-related accidents, but it’s a cause that hits close to home for Eliassen and other extreme skiers. Around 6 percent of spinal injuries are sports related. Most of the guests joining them for the day had earned free passes to Loveland for pre-registering for the Wings for Life race at one of Red Bull’s previous events. Julie Wagner, a board member for the Spinal Cord Injury Project of Denver, expressed her appreciation for the cause and potential for research funding. Seven years ago her husband, Mark, suffered a spinal injury in a car accident that left him almost completely paralyzed from the neck down. She said her son Jack is old enough to remember skiing with him, but John was too young to remember. “If they could have the chance to do that again it would be incredible,” she said. The run will take place May 4 with a unique format — beyond the 4 a.m. start and global participation. Thirty minutes after the races start, “catcher cars” will set out on the course in an attempt to catch runners. When the chase car passes a competitor his or her race will be over. The last person caught will be declared the winner. Red Bull officials said they may host additional promotional events at other area resorts prior to the race.